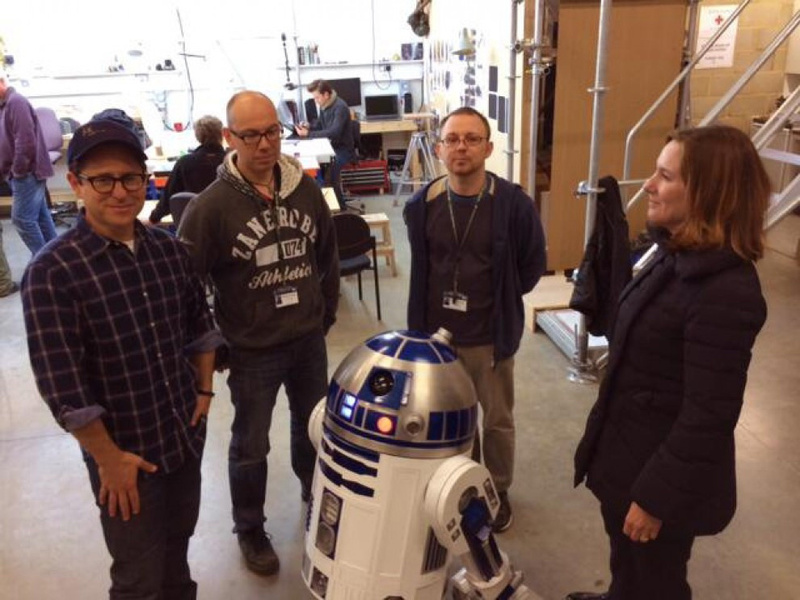 It was always safe to assume that R2-D2 would be in Star Wars: Episode VII, especially after J.J. Abrams released a photo of himself with the droid. Lucasfilm has now officially confirmed that the lovable droid will be included in the upcoming films. The first behind-the-scenes photo from Star Wars: Episode VII hit Twitter last Thursday, featuring director J.J. Abrams, Lucasfilm president Kathleen Kennedy, and a certain blue and white astromech droid — who StarWars.com can now confirm will indeed be in the film. But who are the two men standing behind Artoo, looking very protective of the “overweight glob of grease”? Meet Lee Towersey and Oliver Steeples, Star Wars fans and members of the worldwide R2-D2 Builders Club. They create fully functioning, film-accurate astromech droids like the R2-D2 seen in the photo, and they’re officially part of the Creature Effects team for Star Wars: Episode VII. They didn’t apply for their jobs, but still had what is probably the best reference one could hope for. Steeples, from Berkshire, England, and Towersey, from Middlesex, England, are working full-time on Star Wars: Episode VII at Pinewood Studios (where the Twitter photo was taken), focusing solely on astromech-building — for now. Keeping an astromech droid in working condition throughout the production of a film is a challenge, as it’s filled with gears, lights, and electronics; Steeples and Towersey were chosen because of their expertise and experience, both having worked on Star Wars­-themed commercials for the UK appliances megastore Curry’s. “We know the pressures of filming, prepping, and being able to assure reliability throughout the shoot,” says Towersey, who built the droid seen in the tweet. “We have a good knowledge of Artoo, with a large stock of parts for reference and drawings, plus we know what is involved throughout the whole building process, as well as potential problems we need to avoid.” Despite their impressive understanding of how to construct an astromech droid and keep it functioning, Steeples and Towersey still have a goal for Star Wars: Episode VII: to build a better R2-D2. “What we do need to do is improve on the mechanics,” says Towersey. “We’re currently in a research and design phase where we’re looking at drive options for reliability on all possible terrains, whether it be a one-motor-does-all, or a system which is easily adjusted depending on terrain. We have a few mocked up ideas which we hope to road test very soon.” And while they’re now on the inside of Star Wars moviemaking, the two remain fans at heart.